The fourth edition of the RC 44 Championship Tour will begin in Dubai on February 22 with the Al Maktoum Sailing Trophy. Terry Hutchinson and Adam Minoprio join the Class for this event. The RC 44 Class Association announces a new and exciting program, as well as updated rules for the fourth edition of its Championship Tour. 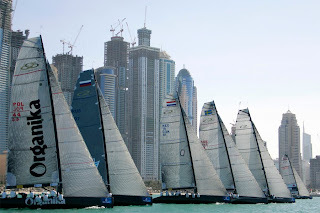 The season will start in two weeks in Dubai with the Al Maktoum Sailing Trophy (February 22 - 27). The fleet will then be transported to central Europe for the Austria Cup (29 April - 4 May), the Copenhagen Cup (8 - 3 June) and a fourth venue to be confirmed soon. The Championship Tour will then move back to the Atlantic Ocean for the RC 44 Puerto Calero Islas Canarias Cup, which will also be the RC 44 World Championship (11 - 16 October), before the season showdown (7 - 12 December). The RC 44 Championship Tour is one of the world’s top sailing events, and other teams are expected to join the Class throughout the season. Several rules have been updated in order to increase the appeal of the Class. For example, the events will now begin with the match race event on day 1 & 2. The third day will be a fleet race practice day as well as a spare day to conclude the match race if necessary. The fleet regatta will take place on day 4, 5 and 6. The long distance regatta is maintained; however it will only take place if an interesting race course is available. As for the points, they will not count double as was the case in the previous years. An official RC 44 World Championship will also take place for the first time in Lanzarote; it will break the possible ties in the annual rankings. Organised by Dubai International Marine Club (DIMC), the Al Maktoum Sailing Trophy will be the season opener on February 22 – 27. The regatta will reassemble nine out of the ten RC 44’s who competed in last year’s Gold Cup. Amongst the favourites, Pieter Heerema and Ray Davies (Team No Way Back) will be keen to confirm the title they conquered during the Gold Cup 2009. As for Terry Hutchinson, who joins the RC 44 Class for the first time on board Artemis, he will be keen to match the brilliant results obtained by Dean Barker last year with this team. Unable to attend the event due to the America’s Cup, Larry Ellison and Russell Coutts will be replaced by Mike Perris (fleet race helmsman) and Adam Minoprio (match race helmsman). Needless to say that Ceeref, the winner of the SLAM Cup 2009 – the match race season title - will have an interesting challenge against the winner of last year’s World Match Race Tour Adam Minoprio and that the comparison will be interesting. 2. 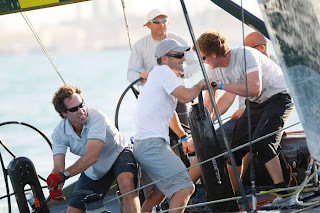 Team No Way Back, winner of the RC 44 Championship Tour 2009.